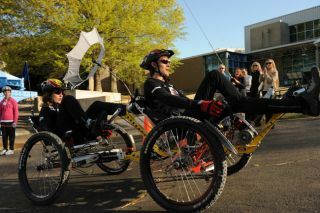 Racers from the International Space Education Institute in Leipzig, Germany, won first place in the high school division of NASA's 17th annual Great Moonbuggy Race. The race is organized by NASA's Marshall Space Flight Center in Huntsville. The team representing the International Space EducationInstitute of Leipzig, Germany, won the high school division, while racers fromthe University of Puerto Rico in Humacao took first place in the collegedivision of NASA's 17th annual Great MoonbuggyRace. The winning competitors beat out more than 70 teams from 18states, Puerto Rico, Canada, Germany, India and Romania. More than 600 drivers, engineers and mechanics — allstudents — gathered with their team advisors and cheering sections to take partin the matchup of wits and wheels at the two-day event, which began April 9 atU.S. Space & Rocket Center in Huntsville, Ala. The annual race is organized by NASA's MarshallSpace Flight Center in Huntsville, and challenges students to design, buildand race lightweight, human-powered buggies that have to tackle many of thesame engineering challenges that Apollo-eralunar rover developers faced at the Marshall Center in the late 1960s. The International Space Education Institute has been aprominent contender in the moonbuggy competition ever since they debuted in2007 as the German Space Education Institute. The team this year included twoRussian students, reflecting the school's expanded international scope. The University of Puerto Rico in Humacao is the only schoolin the world to enter a moonbuggy in every race since the race was founded in1994. The team finished in second place in 2009 and finally captured firstprize this year in their 17th appearance. The winning teams posted the fastest vehicle assembly andrace times in their divisions, in addition to recording the fewest on-coursepenalties. The International Space Education Institute posted a speedy time of3 minutes and 37 seconds. The University of Puerto Rico at Humacao posted atime of 4 minutes and 18 seconds.